The International has always set the bar high for all esports events. Year after year the production value, competition and prize pool to astonish fans around the world and attract attention from mainstream media. This year, The International 2018 is already proving to be no exception and well on its way to stunning the esports scene once again. Single Elimination Bracket. Bo1 matches. All eighteen teams are divided into two groups. Top 4 teams will advance to the Upper Bracket. Group Stage: August 15th – August 18th, 2018 – Like last year, two best-of-two groups of nine teams. Top four teams in each group advance to Upper Bracket, four – eight advance to Lower Bracket, bottom in each group is eliminated. Main Event: August 20th – August 25th, 2018 – As before, 16 teams battle through a best-of-three double elimination playoff. Lower bracket first round is best-of-one, Grand Finals are best-of-five. With the end of The International 8, the traditional post TI shuffle period has begun. The International is a Dota 2 experience like no other. For a week, the entire community comes together to celebrate Dota 2 and to watch the most important competition of the year unfold. This year, OG took home the Aegis in spectacular fashion. Being in Vancouver to watch in person was a pleasure and an honor that I’d like to discuss. After over a week of thrills, excitement and surprises, one of the most memorable events in TI history has come to an end. While filled with storylines and twists, there were a few lessons that stood out for fans to take away. OG won the hearts of spectators and players all over the world in a historic win over LGD, securing the highest prize in esports history, over $11.2 million dollars and the Aegis of Champions to boot. 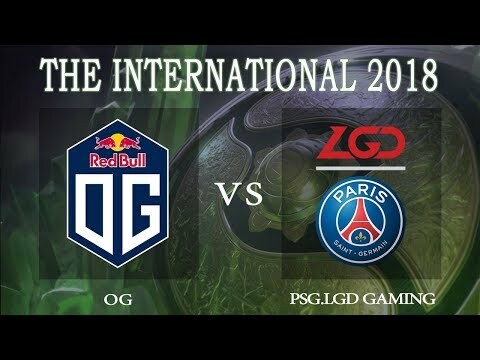 In a quick 2:0 series with fantastic drafts, PSG.LGD Gaming have overpowered Evil Geniuses to advance to the Grand Finals of The International 2018. Dota 2 was first introduced at The International in 2011 and the evolution of production, prize pool and fanfare has since soared high above any other esports event and has even surpassed the prize funds of some well-known traditional sporting events, such as the Cricket World Cup, The Super Bowl, the NBA Finals, and others. Valve took a new approach towards the tournaments, by increasing their base prize-pool through crowd funding, raising monetary contributions from large key audiences. The concept, as applied to esports, was first introduced by the company for The International 3, in 2013, with the release of the virtual “compendium”. At that time, the base prizepool of $1,600,000 was increased by an additional $1,374,381 through the sales to the community. This was a drop in the bucket for what was to come in the following years. The TI7 prize pool was jaw-dropping, recording breaking at a staggering $24,787,916 - a whopping $23,187,916 added by the community. This year, the TI8 prize pool is already outpacing TI7 and on par to meet or exceed the final prize amount. It’s not just the gobsmacking prize pool that draws so much attention. The entire package of production, narrative and high caliber gameplay puts the event over the edge as the pinnacle of all Dota 2 events, if not all esports events. The International brings about shocking results, fairy-tale storylines and triumphs that will remain in the Dota 2 history. Last year at The International 2017 Team Liquid was the first in the history of The International to come back from the second round of the lower brackets and win the entire event. It was also the first time that a team has won with a clean sweep - 3-0 scoreline in the grand final. With past spectacular production including augmented reality features on stage, live orchestra for the opening ceremony, special guest artist Lindsey Stirling, a stage that had special effects in synch with hero ultimates, private practice rooms, closing ceremony featuring electronica music performer Deadmau5, there is no telling what Valve has planned for this year. Continuing to always outdo themselves and the glass ceiling shattered years ago, Valve is expected to put on the show of a lifetime once again. The International 2018 looks set to be another monumental event with another prize pool that will shatter records, and GosuGamers wants to keep you ahead of all the TI 2018 news with our event coverage hub. As world leaders for DOTA 2 coverage, GosuGamers aims to bring you the most comprehensive coverage possible for The International 2018. Armed with a team of Dota 2 fanatics and content creators, , GosuGamers will cover all of the bases you need to enhance your TI8 experience. For everything from news, match reports and schedules to footage from the event and player interviews, GosuGamers.net is your one-stop shop for all things related.